Hayk was born in Echmiadzin (Vagharshapat), Armenia. After graduating the Panos Terlemezyan State College of Fine Arts, he commenced singing studies with the renowned Armenian bass Barseg Tumanyan. While continuing to take individual lessons, he was admitted to the Vocal Department of the Komitas State Conservatory of Yerevan. During his studies, Hayk gave numerous performances in Armenia and abroad. Currently he is a soloist of the Armenian National Academic Theatre of Opera and Ballet. Hayk has received several awards in notable international competitions. 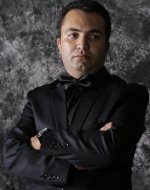 In 2013 he received the 6th prize at the 2nd International Maria Bieşu Competition of Opera Singers in Kishinev; in 2014 he received the 2nd prize in the 7th International Bibigul Tolegenova Singing Competition in Astana. In 2014 he received the 2nd prize at the Republican Singing Competition of Gohar Gasparyan.